ONASAKENRAT (Onesakenarat), JOSEPH (also known as Sosé, Joseph Akwirente, Chief Joseph, and Le Cygne), Iroquois chief and Methodist missionary; b. 4 Sept. 1845 on the seigneury of Lac-des-Deux-Montagnes, Canada East, the son of Lazare Akwirente; d. 7 Feb. 1881 at Oka, Que. 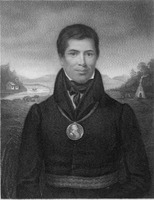 Joseph Onasakenrat’s parents were full-blooded Iroquois who lived on the Ottawa River near the mission of Lac-des-Deux-Montagnes (Oka) established by the Sulpicians. Since both his parents belonged to the Roman Catholic Church, Joseph – or Sosé as he was called in Iroquois – was raised in that faith by the missionaries. On seven occasions between 1787 and 1851 the Iroquois publicly protested the Sulpicians’ claim to ownership of the seigneury. 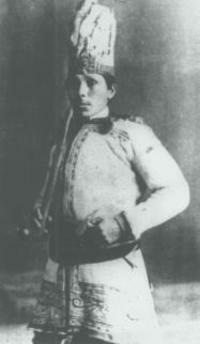 The most serious confrontation arose in 1851 when Joseph Onasakenrat was a small boy. In the summer of that year a native Methodist preacher, the Reverend Peter Jones [Kahkewaquonaby*], visited the mission, discovered the unrest, and came close to convincing a number of Indians to abandon “Popery” and become Methodists. For the moment the Sulpicians were able to maintain their control by having the bishop of Montreal excommunicate the 15 leading native dissidents. The Sulpicians, badly in need of a native spokesman sympathetic to their cause, saw in Joseph Onasakenrat a future leader. A gifted pupil, he was sent at age 15 to the Sulpicians’ Petit Séminaire de Montréal. 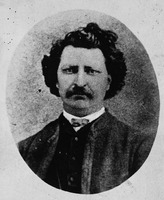 He studied for three years at the college (where Louis Riel was a classmate) and then returned to Oka to become secretary to the Sulpicians under Antoine Mercier*. On 25 July 1868 the Iroquois elected Onasakenrat, then only 22 years old, their principal chief. To the surprise of the Sulpicians, he quickly showed his independence from them by drafting a petition to the governor general protesting against the society’s control of the settlement. The Indians, he pointed out, could not secure title to their lands from the priests or even cut firewood without their permission. He then charged that “these pretended successors of Saint Peter live in a sumptuous place and dress in purple and the finest fabrics”; the priests, he said, were directly responsible for the “poverty and misery” of the Indians. A much more serious setback for the Sulpicians than Joseph’s defection was yet to come. In the winter of 1868 the French Canadian apostate, Charles-Paschal-Télesphore Chiniquy* preached for three days at Oka. After he left, the Iroquois appealed to the Methodists, who had missionaries in the area, to send one to them. Xavier Rivet was appointed to Oka. The overwhelming majority of the Iroquois then renounced Catholicism and joined the Wesleyan Methodist Church in Canada. Chief Joseph now began to fight his opponents with a new vengeance. On 18 Feb. 1869, without first seeking the priests’ permission, he cut down a huge elm tree, thereby challenging their privilege of granting wood-cutting rights. On 26 February he marched with 40 of his band to the Sulpicians’ residence and there in blunt, forceful language warned them to leave Oka in eight days or their lives would be in danger. Assured of the faithful support of the Algonkians, who constituted about one-fifth of the total Indian population of 500, the priests quickly obtained a warrant for Joseph’s arrest. On 4 March he and his two fellow chiefs were seized by Montreal police, but within weeks Joseph was out of jail and again leading the struggle. In late December 1869 he forwarded another petition to the governor general in which he summarized the Iroquois complaint: “From what our fathers have told us we always believed as they believed, that these lands were given in the first instance by the King of France to the Seminary for our use and interest; now however we are told that the lands belong to the Seminary, and that we live on them and use them only because they permit us to do so.” Nevertheless from 1868 the federal government had refused to accept the Oka Indians’ claim to ownership of the seigneury and affirmed the Sulpicians’ claim to sole legal title. Throughout the 1870s the strife continued at Oka. The police, summoned by the priests, frequently arrested Iroquois for cutting wood in the forests and for tearing down fences erected by the Sulpicians. In December 1875 the Sulpicians dismantled the Methodist church in the Indian village, claiming that the Iroquois had had no legal right to erect it. Then on 15 June 1877 the Sulpicians’ church itself mysteriously burnt down. The priests accused a number of Iroquois, who in turn claimed that they had arrived only after the fire had begun. Warrants were issued for the arrest of Chief Joseph and his father (both seen by a Sulpician at the scene of the fire), as well as a dozen others. All were accused of arson. Wealthy English-speaking Protestants in Montreal came forward to help the accused, providing bail and legal aid. The case was finally dismissed in 1881 after four juries failed to reach a verdict. Upon his release on bail Joseph returned to Oka where he acted as interpreter for the resident Methodist missionary. He began translating the Bible and by June 1880 had translated the four Gospels from French into Iroquois. In 1880 he was himself ordained a minister by the Montreal Conference of the Methodist Church of Canada and assigned as a missionary to the Iroquois settlements at Caughnawaga and Saint-Régis. His ministry proved a short one, however, because he died suddenly at Oka on 7 Feb. 1881 at age 35. In the last year of his life Joseph had reversed his stand against the Sulpicians and had begun advocating a peaceful solution to the conflict. The charges of arson had not yet been finally disposed of, but Joseph’s ordination as a Methodist minister seems to have pacified him. He urged his people to accept the priests’ offer to buy land for them elsewhere and to move them there at the Sulpicians’ own expense. But in advocating moderation, Joseph lost the support of his people, who would follow his counsel only as long as he championed what they felt were their basic rights. Six months after his death the majority of the Oka Iroquois dramatically voted against his “peace policy.” In the fall of 1881, when the time came to move to the lands in the Muskoka region of Ontario purchased for them by the Sulpicians, only one-fifth of the Iroquois consented to move. The “Oka Question” continued unresolved for 30 years after Joseph Onasakenrat’s death, before the Supreme Court of Canada finally upheld the Sulpicians’ title in 1910. ASSM, 8, A. McGill Univ. Arch., Wesleyan Methodist Church in Canada, Montreal District, Minutes, 1870–73. McGill Univ. Libraries (Montreal), Dept. of Rare Books and Special Coll., ms coll., CH101.S119, CH119.S139. Methodist Church (Canada, Newfoundland, Bermuda), Montreal Conference, Minutes (Toronto), 1884–90. Methodist Church of Canada, Missionary Soc., Annual report (Toronto), 1874–81; Montreal Conference, Minutes (Toronto), 1874–81. Amand Parent, The life of Rev. Amand Parent, the first French-Canadian ordained by the Methodist Church . . . (Toronto, 1887). A. R. Hassard, Famous Canadian trials (Toronto, 1924), 106–23. A. L. Hatzan, The true story of Hiawatha and history of the Six Nation Indians (Toronto, 1925). Philip Laforce, A history of Gibson Reserve (Bracebridge, Ont., n.d.). John Maclean, Vanguards of Canada (Toronto, 1918), 167–79. Claude Pariseau, “Les troubles de 1860–1880 à Oka: choc de deux cultures” (thèse de ma, McGill Univ., 1974). J. K. Foran, “Chronique d’Oka,” Le Canada (Ottawa), 2, 10, 19, 22 juill., 3, 12, 19, 30 août, 9, 13 sept. 1918. Olivier Maurault, “Les vicissitudes d’une mission sauvage,” Rev. trimestrielle canadienne (Montréal), 16 (1930): 121–49. Donald B. Smith, “ONASAKENRAT, JOSEPH,” in Dictionary of Canadian Biography, vol. 11, University of Toronto/Université Laval, 2003–, accessed April 21, 2019, http://www.biographi.ca/en/bio/onasakenrat_joseph_11E.html.